The horror genre has long been a medium for filmmakers to depict broad societal anxieties and fears, but characters of color — and specifically African Americans — have historically served as one-dimensional or sidelined characters in the genre. Peele secured yet another mega hit in his newest horror-thriller, Us – centered around an upper-middle-class black family – premiered March of this year, already breaking box office records as the highest grossing original horror film and film starring a black female lead. Although long before the Sunken Place and scissor wielding doppelgangers, black narratives have been integrated into the horror genre for decades. This list includes the most frightening and brilliant horror gems featuring black leads, from purely shocking scares to more tactful works of social commentary, including some of horror’s most groundbreaking films. This cult classic serves as both a seminal piece of horror history and forerunner for positive depictions of people of color on film. Featuring horror’s first black lead, Duane Jones, stars as the zombie-fighting protagonist who along with seven others finds himself trapped in a rural farmhouse surrounded by legions of flesh-hungry “living dead.” Directed by George A. Romero, this independent film opened up new avenues in horror, inspiring a multitude of other legendary filmmakers and artists while pioneering the zombie-thriller genre. Before there was Bella and Edward, this dynamic thriller beguiled audiences with a seductive portrayal of two vampiric lovers torn between death and desire. A breath of fresh air from the troublesome blaxploitation films of the time, Ganja & Hess, is complex, experimental, stylishly art house and poignantly allegorical. 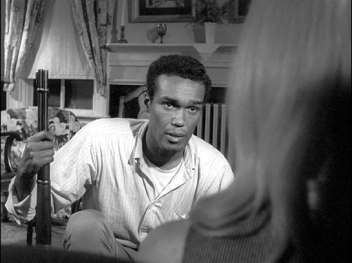 Duane Jones, yet again, delivers a killer performance as Dr. Hess Green, an anthropologist turned blood-sucker, who navigates a turbulent romance with Ganja (Marlene Clark), wife of the man responsible for his curse. The film was named one of the ten best American films of the decade by the Cannes Film Festival, and inspired Spike Lee’s 2014 remake, Da Sweet Blood of Jesus. 90’s slasher films brought a host of terrifying pop culture boogeymen, from Freddy Krueger, Jason Voorhees to Leather-face. Although, few stand up to the shock and pure fright power of 1992’s Candyman, who unlike the name suggest is not filled with sweets. Tony Todd stars in the titular role, as the ghastly yet complex phantasm who terrorizes Chicago’s now-demolished Cabrini Green projects. Although, rightfully criticized for the inclusion of a white-savior narrative, the film endures as a cult classic and nuanced interrogation of America’s racial history. Jordan Peele is set to re-imagine the film for contemporary audiences, hopefully overturning the original’s problematic elements. Based on Toni Morrison’s novel of the same name, this Oscar-winning saga follows the story of Sethe (Oprah Winfrey), a mother and former slave, whose home is haunted by an enraged poltergeist. The genre bending film merges elements of black spiritualism, horror, and magical realism, serving as a poignant allegory of the haunting legacy of slavery in the American south. The notorious Purge series finally gets an origin story in its fourth installment, which features an added dimension to the franchise: nuanced social commentary. The film features a black-led cast fighting against the government’s insidious experiment to eliminate low-income and minority populations – what later becomes The Purge (a 12-hour period during which all crime, including murder, is legal). The initial test is launched in predominantly black and brown neighborhoods, and when residents refuse to engage in the event, the government takes alternative measure to make sure the first purge is a success. Opening with this provocative yet succinct proposal: “Black history is black horror,” this documentary explores genre and history-defining moments in black horror cinema. Based on Dr. Robin R. Means’ 2011 academic anthology, the documentary assembles Jordan Peele and other prominent black voices to unpack the horror genre’s racialized history – starting with Birth of a Nation – to horror’s most recent resurgence with Oscar-winning and commercial hits, Get Out and Us.